Upgrading campus security without disrupting classes or alarming the students. 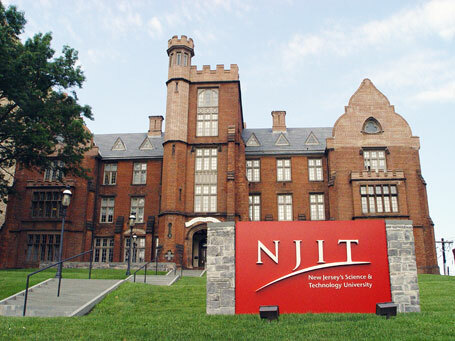 Long time customer, New Jersey Institute of Technology (NJIT), is located in the vibrant University Heights district of Newark, 20 minutes from Manhattan by train. In 2013, it began a campus security upgrade plan to be rolled out in four phases. NJIT Director of Security Systems, Rob Gjini elected to upgrade a much older AMAG Technology access control system to a state-of-the-art Symmetry™ Security Management System. The new version of Symmetry Access Control with Symmetry Video and Encoders integrates with a DMP alarm system. NJIT has more than doubled the size of its campus over the past two decades and the security upgrade will allow them to remain on the cutting edge of technology and effectively secure its students, faculty, staff and 36 buildings. The Public Safety Department (NJIT’s police department) works closely with Gjini’s Security Systems, Photo ID and Parking Services Department. The Public Safety department’s 24/7 dispatch center utilizes three Symmetry workstation clients. Officers monitor and respond to alarms and activity throughout the campus. Workstations use Symmetry Video’s customized virtual matrix to pull up and view campus video. IP cameras and DMP alarm panels are integrated and linked back to Symmetry. The automated system is faster and operates in real-time, providing officers with the information they need to make quick and accurate response decisions. The Security Systems, Photo ID and Parking Services Department supports the Public Safety Department and the equipment necessary to secure the campus. They manage the Symmetry security system itself, badge creation and distribution, and assigning correct card access rights for all students, faculty and staff. They are also responsible for contractor card distribution, security installations, security upgrades and system training. All new faculty, staff and students are issued their first NJIT photo ID card free of charge. Students must validate their cards each semester after registering for classes to obtain authorized access to any buildings necessary to complete their education. The card is used as a student ID, to gain parking lot access, for card access, after business hours ID access (if authorized), to ride the shuttle bus, library services, meal plan services, gym access, laboratory usage and special event admittance. Managing card access for a 10,000+ student population with a high turnover rate proved difficult to manage. Gjini and his team manage over 20,000 access privileges. They assign and remove nearly 13,000 privileges each semester. Keeping a handle on those numbers was nearly impossible until AMAG Technology’s Professional Services Department stepped in and developed a custom middleware solution to integrate with their Banner Student information system, which is a central repository for all student information. The custom middleware sits on top of the Symmetry database and compares it to the Banner database. The databases sync up and provide an accurate list of students who need a Symmetry access card and privileges. The installation of the Symmetry SMS was completed by AVS Technology. 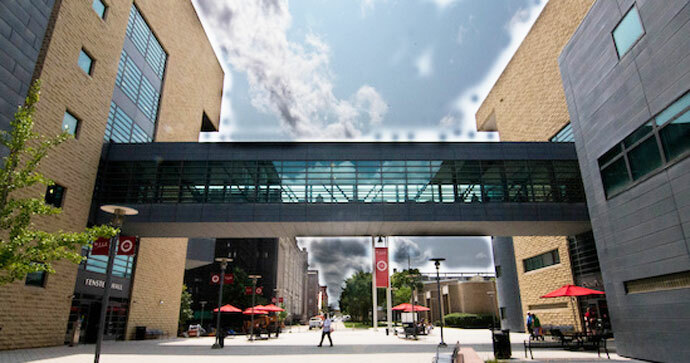 During phase two, NJIT upgraded its analog video surveillance infrastructure from coax and fiber cable to Symmetry encoders that communicate over the NJIT IP network. This allowed them to record video on virtual servers. After working closely with the IT department because of bandwidth needs, now the Public Safety Department (NJIT police) can call up video associated with alarms and see all activity in real time. Seeing campus activity in real-time provides accurate data where they can make quick decisions with regards to how to respond to alarms, providing a more secure environment. Phase three included updating NJIT’s old alarm system to DMP alarm panels. The DMP panels report commands back to the Symmetry command console and call up instructions on how to respond to alarms. The instructions save time, create more efficiency and improve response times. Magstripe readers are located on building entrance doors and many interior doors. Interior offices, computer labs and research labs are controlled through the DMP panel that communicates with the Symmetry head end via the NJIT IP network. NJIT plans to upgrade its magstripe readers and cards to smart card technology when funding is available. Students living in the residence halls must pass through three tiers of security before reaching their room. First, they swipe their card on the exterior door Symmetry magstripe reader to enter the vestibule. From there they hand their card to a desk attendant who must physically verify who they are and then the attendant swipes the card at reader located behind the desk which grants the student access to an interior door. Once inside the lobby, the student must swipe into the elevator lobby. “We understand that parents and students are concerned about security, especially in an urban environment like Newark, and Symmetry helps NJIT provide that extra layer of security where our students live,” said NJIT Director of Security Systems, Rob Gjini. The Public Safety Office is a stop on the NJIT campus tour where families can see the dispatch center and are shown the Command Center. Officers answer questions about how school safety is managed and how the Symmetry Security Management System helps them keep students safe. Officers also attend student orientations and give speeches throughout the year about NJIT’s security procedures and Symmetry card access system. Schlage® locks were installed in the new Honors Residence Hall which opened in 2013 and is home to the Albert Dorman Honors College. Students can use their photo ID card to gain access to their room through the use of a card swipe and PIN. While most buildings are open throughout the day allowing faculty, staff and students to enter as they wish, some campus perimeter doors leading to the Student Mall, the parking deck, Weston Hall, the Central Avenue quad doors leading to the Guttenberg Information Technologies Center and the Mechanical Engineering building require a card swipe with a valid facility code to enter and exit. In the evening, the Symmetry system automatically switches to Secure Access Mode where only authorized individuals can swipe into the buildings. Biology research labs are locked around the clock and require a card swipe by an authorized person to enter. Rooftop PTZ cameras sweep large areas including parking areas, and fixed cameras watch over card readers and building entrances. Cameras are also located in research buildings, hallways and elevators. Due to the nature of the gymnasium and the large variety of events held in that location, a separate video system monitors all entrances, hallways, the gym and surrounding exterior area. Eventually this will be integrated into the Symmetry system. Is Gjini happy he moved over to Symmetry? Absolutely, and feels a good security system isn’t always for catching the bad guys; it’s for helping the good guys. Shortly after Symmetry was installed, there was a shooting in an adjacent town’s night club. A resident NJIT student was suspected. When questioned, the student claimed he left the club before the shooting occurred. The prosecutor’s office contacted the NJIT security team and the Symmetry Security Management System proved he swiped into the parking lot and his dorm. Video confirmed it. The prosecutors let the student go. Installing integrator, AVS Technology has worked with NJIT for the past 20 years and supported them through their upgrade process. AVS has created a reputation for providing superior system design, installation and service for their clients. AVS provides first class technical support for their clients by setting up their system in house. They can remote in and view NJIT’s Symmetry panels and troubleshoot issues without the expense and hassle of driving to campus. NJIT values this level of service and is one of the many reasons they are happy with AVS Technology.